Erroneously considered a damning of collectivism, Orwell's allegorical fantasy is a critique of the Bolshevist and Stalinist regimes set on a farm as animals attempt to create a society. Some little-known anarchists Part 2. There's a rumour this was offered to Freedom Press by Orwell but they turned it down. Excellent, thanks for posting that. 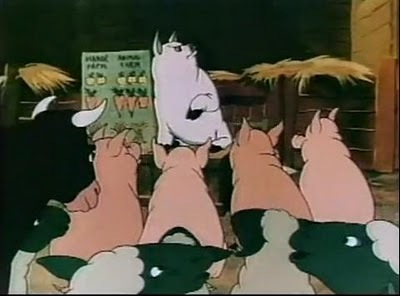 And after all, your pigs are far more intelligent than the other animals, and therefore the best qualified to run the farm—in fact, there couldn’t have been an Animal Farm at all without them: so that what was needed, (someone might argue), was not more communism but more public-spirited pigs. In the case of Trotskyists, there is the added complication that they feel responsible for events in the USSR up to about 1926 and have to assume that a sudden degeneration took place about that date. Whereas I think the whole process was foreseeable—and was foreseen by a few people, eg. Bertrand Russell—from the very nature of the Bolshevik party. What I was trying to say was, “You can’t have a revolution unless you make it for yourself; there is no such thing as a benevolent dictatorship." George Orwell, in 1944 was, outside of the Left, not generally known. He had completed Animal Farm in February, 1944. It was rejected by his publisher Victor Gollancz, and also by publishers Jonathan Cape and Faber and Faber [Eliot], on political grounds. It was published by Secker and Warburg in August, 1945. Apparently none of the people using Animal farm or 1984 as a critique of collectivism noticed Orwell was a socialist who went to fight for POUM in Spain.